That is not a horizontal 3-sheet -- I believe the original is a French 2p which should measure about 62" tall by 92" wide. So even more impressive, but the original would never fit in this display. 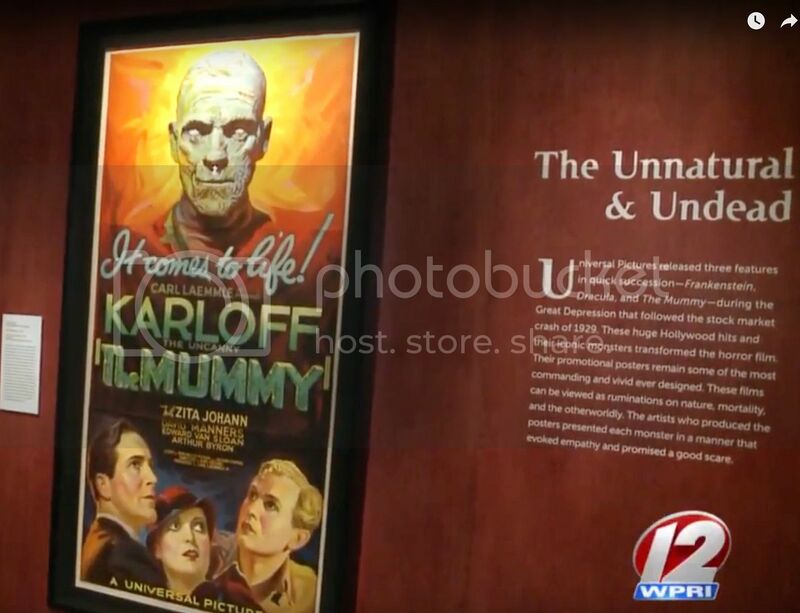 I found some youtube clips of folks that had been there, and the small placards in front of the Dracula OS would, for example, only say, "Dracula Poster 1931, Universal Studios, CA." No mention indicating that these were not the real deal. Unless somewhere in the booklet, mention is made of this. 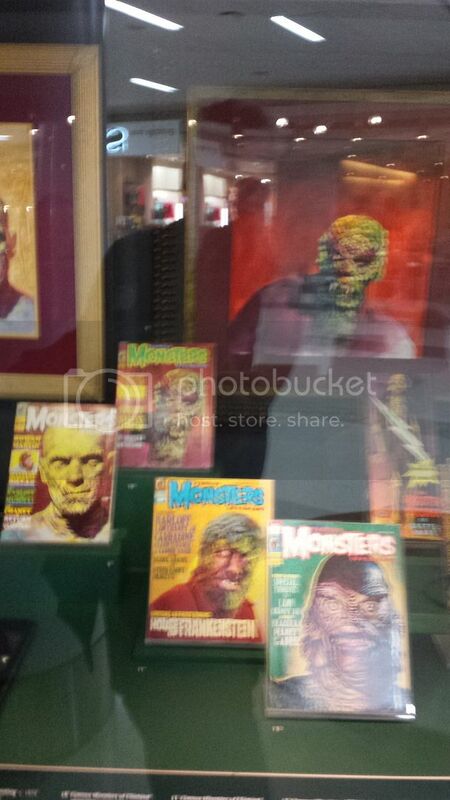 I googled this exhibit, too, and the several story sites that wrote about it all mentioned (as MAGG did) that the toys, props and original art pieces by Basil Gogos (some of his cover art used on Forry Ackerman's "Famous Monsters of Filmland" magazine), were genuine, but no mention was made of the posters. But it looks awesome! Thanks again, for posting your pics, too, Shawn!! I wish i was flying thru SFO sometime before this closes in Dec.
Hey Crazy Vick, Harry Caul is correct. That is (supposed to be) a French 2 Sheet. I don't know French sizes all that well--so that wasn't the real tip off for me. BUT...I know of French Petites and Thierry hates "French Grande"s. If they were trying to make a big impression with a 2 sheet, why bother with the petites? Thierry hates "French Grande"s would make more sense...and it is way too small for that. But again, I am not super familiar with French sizes. Jeff, all I can imagine from the Youtube videos and websites you saw about this is that none of the people who posted about it are poster enthusiasts and they didn't realize they were seeing fakes. My friend didn't...and I (taking it at face value) probably wouldn't have either had my friend not made his comment about them being so perfect for their age...causing me to look closer...and then seeing the alleged three sheet. 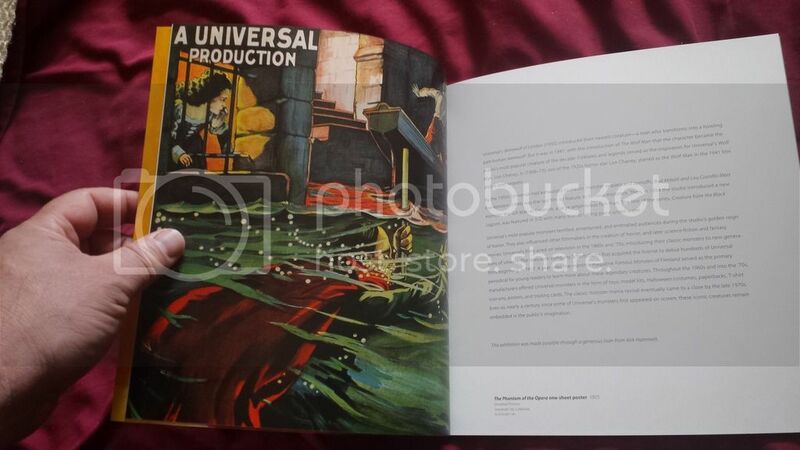 Also of note to you was in the booklet, they show part of a one sheet from "PHANTOM OF THE OPERA"...but there was NOT one there on display. Thanks for posting that, Shawn. The "Underwater" style OS for Phantom, is one of the best (if not the best, imho). Hey....who edited my text above to read "Thierry hates "Thierry hates "French Grande"""s? Ha! Oh...it does it automatically. Ha! Thierry hates "Thierry hates "French Grande""! T believes that the term French Grande used by most people and businesses to describe a French poster of size 63 X 47 inch makes no sense... "French Big". T hates that term and prefers to call it I think a French one panel. So some mod here set up an automatic text replacement when it is written. To me, panel and sheet are just as confusing.... You can have a small or large one piece of paper which gives no indication to its size. he'd go crazy getting car directions down South or in the Midwest where directions are "you go down this road a ways.."
"I don't know. I never measured it. you go down that way"
"yes but how far do I go"
"it's a ways down that way"
"thanks.. but how far is it that ways"
"hey you #@*^ it's down that way a ways. $^%$ you"
Thanks for posting those, Shawn! 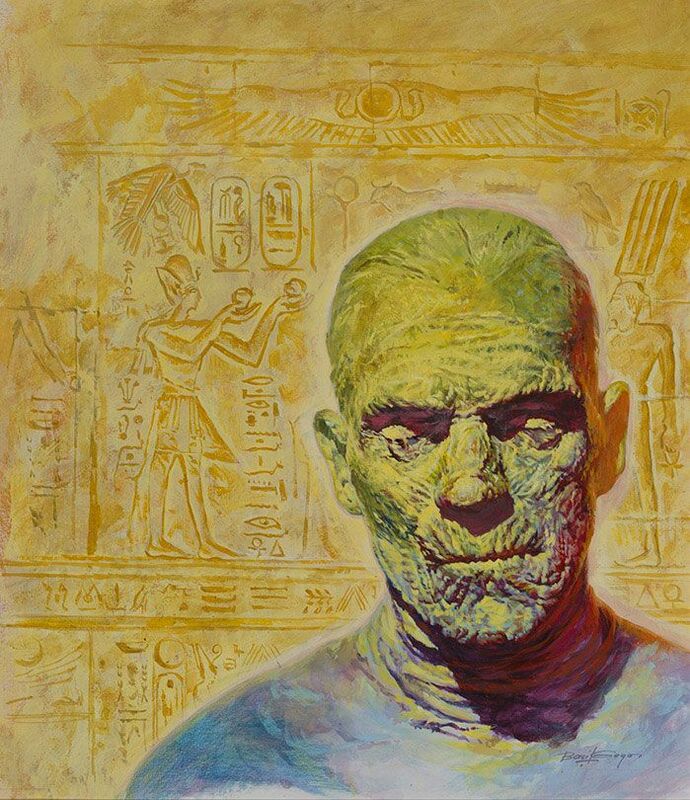 More Basil Gogos goodness. That man can paint... no question. 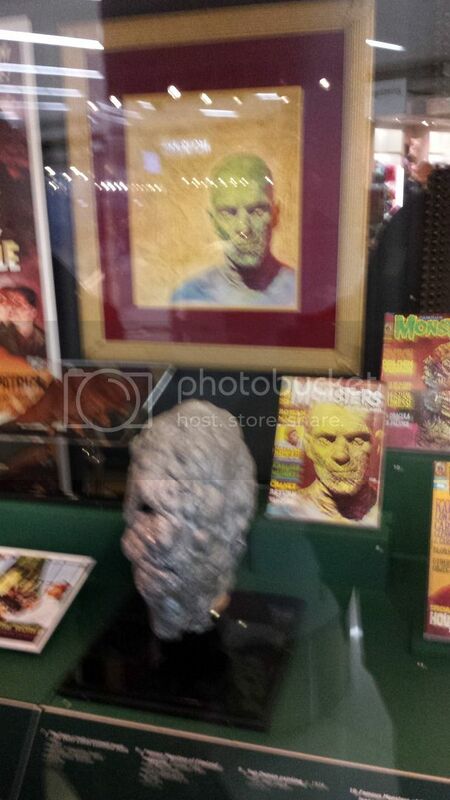 I found this site that gives the Nov. 2002 auction results of the original Hideous Sun Demon painting that Gogos did for the "Famous Monsters Of Filmland" magazine cover, issue #106, in April 1974. Zowie! That is quite a sum for that painting. Jeepers! Of course, i'm sure he spent far, FAR more on his one sheets. For an ORIGINAL painting?? I think he got it for a song. 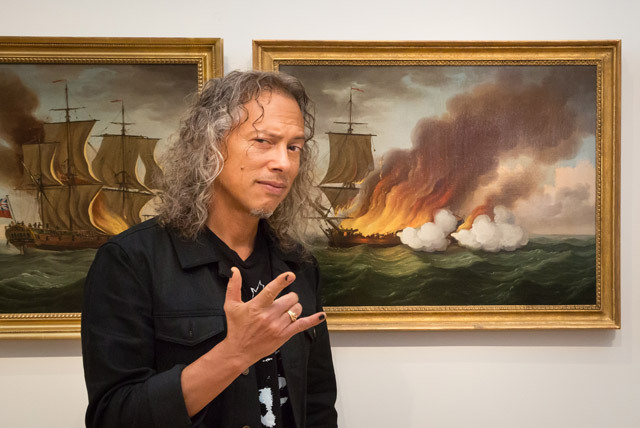 A couple blog entries by a guy (Wayne, the New England Nomad) that went to see the K. Hammett "It's Alive" exhibition in Salem, MA, this past October. He's got a nice selection of photos in each part, too. Looks like a better display than at the SFO airport that time. 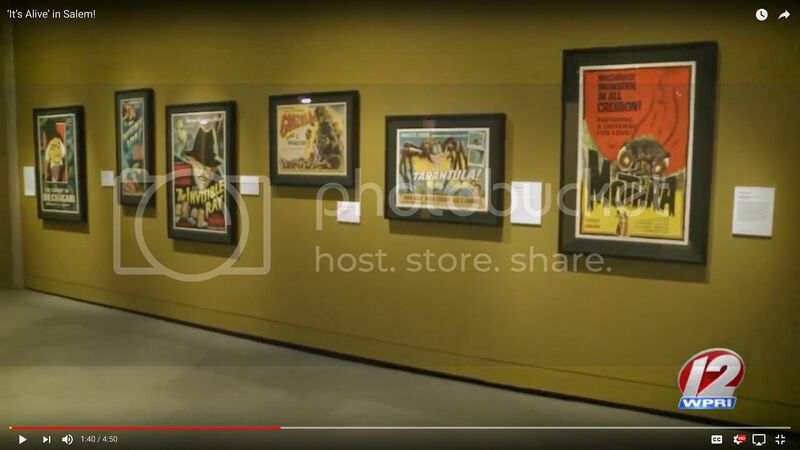 Also, the video showed something I'd never thought to see...he has some of the same posters ("Alien", "Blacula" and maybe "Mothra") I have...and they were on display! Ha! I doubt there were any repros here (unlike the SFO one). Cool! Good interview with KH, says "the hope is to take the collection to more venues around the world, across the States...."
You can see he has some posters framed and on display. I assume they're originals as he doesn't strike me as someone who'd display a bunch of repros. 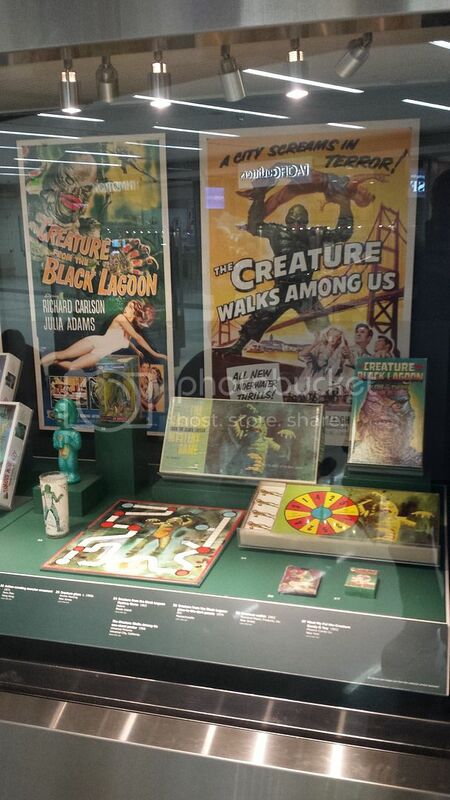 Another cool article from 2015, discussing the exhibit that was on display at SFO. 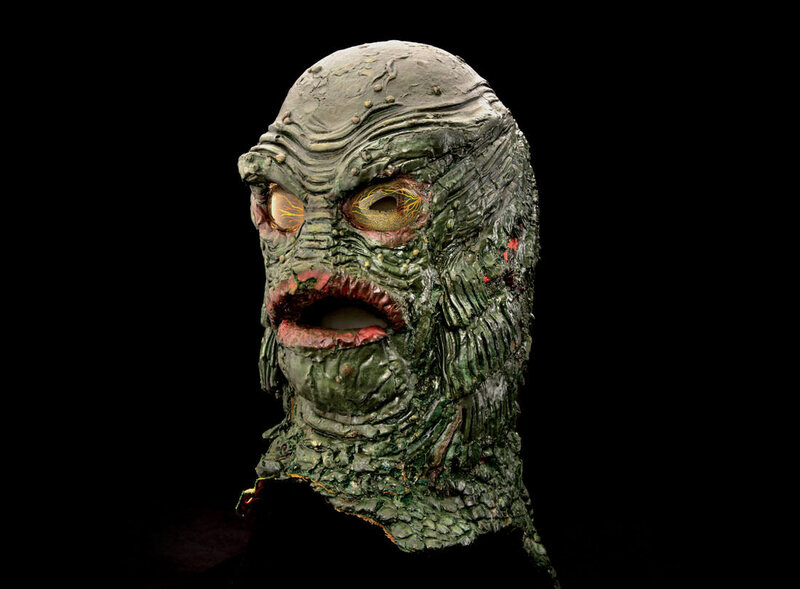 Including what is described as a "prop head" from Revenge of the Creature (1955). Not sure if this was a dummy prop, or if they meant to call it a mask used in the movie. Either way...it's very cool! !